Wage growth likely will pick up in the coming months despite the more modest pace of job gains in recent months, according to Bloomberg BNA’s Wage Trend Indicator released June 15. The wage trend index climbed to 100.18 in the second quarter from 100.15 in the prior quarter. The WTI has risen by nearly 1 point since 2014. U.S. employment grew by 138,000 jobs in May, while the jobless rate fell another notch to a 16-year low of 4.3 percent, the Labor Department reported June 2. Monthly payroll gains are averaging 162,000 this year, a step down from the 2016 pace of 187,000. Kobe said that if the economy continues to expand at its recent pace, the overall rate of private-sector workers’ annual pay increases should rise above 2.6 percent to as much as 3 percent in the next six to nine months. The tightening labor market will lead to higher wage growth, as employers compete for a smaller pool of available workers and try to attract employees away from their current jobs, she said. Wages and salaries increased 2.6 percent in the first quarter, up from a 2 percent gain in the same period of 2016, according to the DOL. In 2007 before the recession, annual increases ranged from 3.3 percent to 3.6 percent. The WTI forecasts the direction of wage trends but not the amount of change. Reflecting recent economic conditions, four of the index’s seven components contributed to the index’s second-quarter rise, while three factors were negative. Helping boost the WTI was the percentage of employers planning to hire production and service workers in the coming months, measured by Bloomberg BNA’s quarterly employment survey. The other positive components were the unemployment rate and job losers as a share of the labor force, both from the DOL, as well as industrial production, reported by the Federal Reserve Board. Acting as a drag on the index was the proportion of employers reporting difficulty in filling professional and technical job openings, also from Bloomberg BNA’s survey. The other negative factors were average hourly earnings of production and nonsupervisory workers, from the Labor Department, and economic forecasters’ expectations for the rate of inflation, compiled by the Federal Reserve Bank of Philadelphia. Over its history, the WTI has forecast a turning point in wage trends six to nine months before it has become apparent in the Labor Department’s employment cost index. A sustained increase in the index is predictive of greater pressure to raise wages in the near term, while a sustained decline forecasts a slowdown in the rate of wage growth. The final second-quarter index will be released on July 18. 1 Advance forecast (one year ahead) of the percentage change in the chain-weighted GDP price index, as measured by the Federal Reserve Bank of Philadelphia's Survey of Professional Forecasters. 2 Annual (12-month) percentage change in average hourly earnings of private industry production and nonsupervisory workers, as measured by the Bureau of Labor Statistics. Percentage changes are calculated from changes in natural logarithms. 3 Two-quarter average of the percentage of employers reporting difficult-to-fill professional/technical job vacancies, as measured by BNA’s Survey on the Employment Outlook. 4 Four-quarter average of the percentage of employers projecting production/service workforce growth, as measured by BNA’s Survey on the Employment Outlook. 5 Percentage of the civilian labor force who have lost their jobs or completed temporary jobs, as measured by the Bureau of Labor Statistics. 6 The civilian unemployment rate four quarters ago, as measured by the Bureau of Labor Statistics. 7 Annual (12-month) percentage change in the Federal Reserve’s industrial production index, four quarters ago. Percentage changes are calculated from changes in natural logarithms. 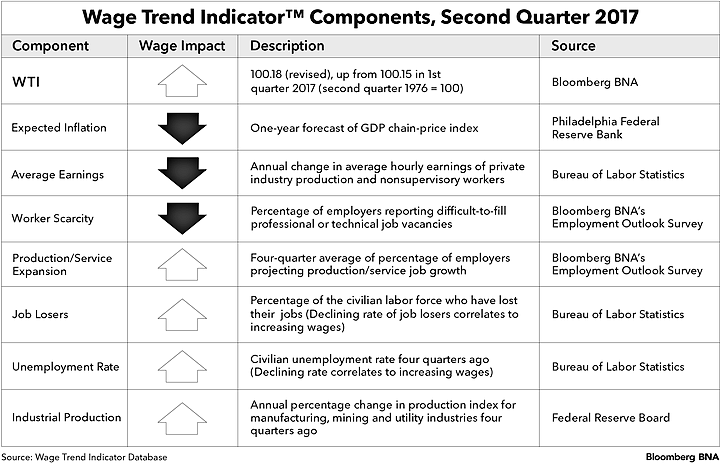 8 Changes in the Wage Trend Indicator are a composite of changes in its seven components, adjusted for their amplitude and the direction of their impact on private industry wage growth. Note: See technical notes for additional details on the components of the Wage Trend Indicator. 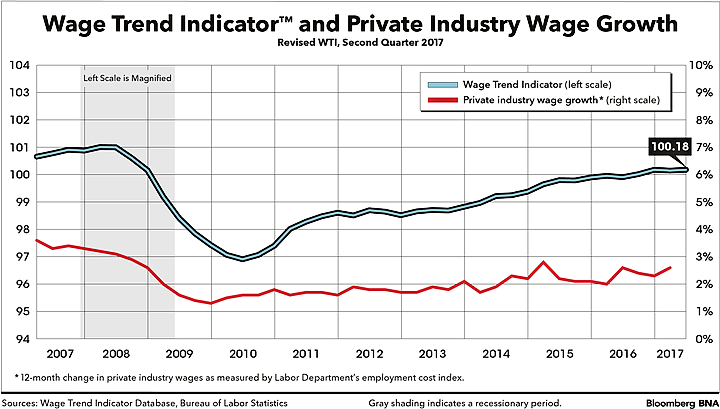 The Wage Trend Indicator (WTI) is designed to predict changes in private industry wages as measured by the Bureau of Labor Statistics' employment cost index (ECI). The ECI was chosen, in part, because it holds constant the mix of industries and occupations across the U.S. economy, thereby showing changes in compensation without the influence of industry and job shifts. • Expected inflation: Expected inflation (as measured by the percent change in the gross domestic product chain-price index) during the next four quarters is reported by the Federal Reserve Bank of Philadelphia in its Survey of Professional Forecasters. There is a positive relationship between wage changes and an increase in expected inflation. • Average hourly earnings: Average hourly earnings of production and nonsupervisory workers on private industry payrolls are derived from the Bureau of Labor Statistics' monthly survey of about 400,000 nonfarm establishments. (Unlike the ECI, the average hourly earnings data are affected by industry and occupational shifts.) The indicator uses the 12-month percent change in earnings for the first month of each calendar quarter. There is a positive relationship between changes in average hourly earnings and changes in wages. • Scarcity of professional/technical workers: The two-quarter average of the percentage of firms reporting difficulty in filling professional and technical jobs is derived from Bloomberg BNA's Employment Outlook Survey. There is a positive relationship between this measure and changes in wages. • Production/service workers expansion: The four-quarter average of the percentage of firms planning to hire production and service workers is derived from Bloomberg BNA's Employment Outlook Survey. There is a positive correlation between increased hiring of these workers and changes in wages. • Job losers: The percentage of the labor force who have lost their jobs or completed temporary jobs is derived from the Bureau of Labor Statistics' monthly survey of 50,000 households, or current population survey. The indicator uses the average of the three months of each quarter. There is a negative relationship between job losers and wage changes; a declining rate of job losers correlates to increasing wages. • Civilian unemployment rate: The unemployment rate is the percent of the civilian labor force 16 years and older that is currently unemployed. It is derived from the Bureau of Labor Statistics' monthly survey of 50,000 households, or current population survey. The indicator uses the average of the monthly unemployment rates for the quarter a year ago. There is a negative relationship between the unemployment rate and wage changes; a declining unemployment rate correlates to increasing wages. • Industrial production: The index of industrial output in the manufacturing, mining, and utility industries is based on the year-over-year rate of increase in the Federal Reserve Board's industrial production index one year earlier. There is a positive relationship between increasing production and wage changes. These seven components were selected from about four dozen series of wage-related economic data that were studied. They were determined to be the best at predicting accelerations and decelerations in the rate of increase of private sector wages and salaries, dating back to 1976, when the employment cost index first became available. The accompanying graphics and table summarize the latest data. Technical notes explaining the seven components also follow. For additional information, including how to obtain a subscription to WTI reports on a regular basis, call BNA Research & Custom Solutions at 800-372-1033 or 703-341-5870 in the Washington, D.C., metropolitan area.